Find out all about the Earth’s climate. Watch a video clip about weather and climate. Play a weather game and find out about Earth and its weather. What is the greenhouse effect? Why do hurricanes happen? How can we stop global warming? 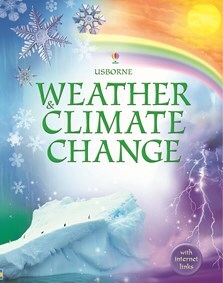 This informative introduction to weather and climate explains key concepts using stunning photographs, detailed diagrams and clear text. With contents and index pages, plus Usborne Quicklinks to recommended websites with more information and video explanations. Usborne are well-known for the quality of their educational books, and this one is no exception. It tackles the very topical issue of climate change, while putting it in the context of weather patterns generally. It is written with internet links on every page, so that readers can explore the topic in greater depth if they have access to a computer, and comes with some sensible advice for parents about supervised access to the internet. It tackles some difficult science in an accessible way, without being patronising. The layout of the pages is excellent and there are some beautiful photos.